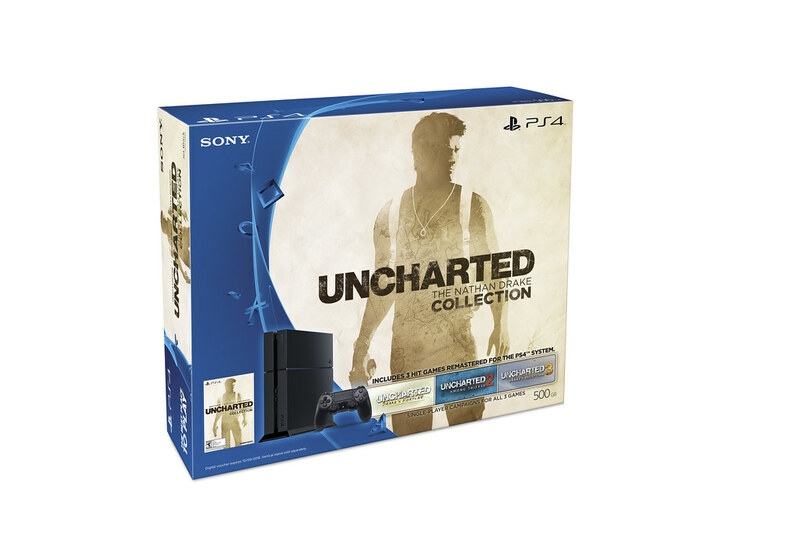 Uncharted fans — we have a new PS4 bundle coming soon to celebrate Nathan Drake’s legendary adventures. The Uncharted: The Nathan Drake Collection PlayStation 4 Bundle will include a 500GB PS4 and the first three, critically-acclaimed Uncharted games for PS4. The single-player campaigns for Uncharted: Drake’s Fortune, Uncharted 2: Among Thieves, and Uncharted 3: Drake’s Deception are all included as part of this bundle. You can get your hands on the bundle when it launches on October 9th, the same day the collection hits, for $399.99 US / $449.99 CAD (MSRP). The bundle is great for Uncharted fans who want to relive those epic moments of Nathan Drake’s globe-trotting adventures on PS4; with beautifully remastered graphics, brand-new game modes, and a host of gameplay refinements that evolve all three games. It’s also perfect for anyone who wants to uncover the story of the famed fortune hunter for the very first time before the highly-anticipated release of Uncharted 4: A Thief’s End on March 2016. The games look incredible on PS4. As an additional treat, here’s a first look at our TV spot for the collection, which will air nationwide starting this Saturday. Be sure to check back on PlayStation.Blog for more Uncharted news. So tell us, what’s your favorite Nathan Drake moment? Great idea for a bundle guys! I’m sure this will get people who have yet to play this fantastic franchise to jump on board. Great bundle Sony. I’m sure you’re going to sell a lot more PS4 with that bundle. It is the absolute best marketing strategy, you bundle games with your system. Not only does it add value to the customer, but it also makes great publicity for the franchise. People play the game, then many love them and they go and buy the sequel to the franchise. I’ve been telling Sony to do this for years, see how much you are selling despite the price. It worked for the Win. It worked for the SNES. It worked for the PS2. It just works. I feel jealous of the people who will play this for the first time! My favorite moment has to be the train chapters of Uncharted 2. Odd, I thought it was a decent port for Vita. Uncharted Golden Abyss on the Vita is a completely new game. Not a port. Perfect bundle for 360 owners of last gen. Kinda Funny if you ask me. You Kinda Funny plebs are annoying. It is great in my opinion, millions went from 360 to PS4 and skipped the Xbone. So they never got to play the Uncharted games but they heard about them and how good they were, now they get to finally see what the fuss was about. You just knew this was coming. There just has to be an “Uncharted” bundle in the list of PlayStation bundles one can purchase. Good job Sony. Nice. Though one has to ask, when are we getting the Uncharted Collection Demo, promised for Summer, on PSN? I don’t recall it being “promised” (that word gets thrown around incorrectly way too much lately), but it was “announced” for Summer and Fall starts on September 23rd, so there are three Tuesday Store updates that the demo can be released on and still hit the Summer announcement deadline. Yes, last I heard. We’ll keep you posted on timing. Yea see, here is the problem that kept me from moving towards a PS$, and switching over to Steam instead. Remastered was a cheap way to get members who already bought it, to pay to do, what computers already do. It should be free to your past loyal customers, who paid for digital. ….And why I no longer respect/support Sony. Are you kidding me? Go play Star Wars Battle Front 2 on PC on Ultra settings. The graphics will still look bad because the game is OLD. However if it were remastered it could look way better then it ever could have in the original game on ultra. Why would I. Also, you picked a game that could use a “Real Remaster” , hence Battlefront for P$more. But there are numerous titles, this being one, that no real work was put into. How about almost every Plus discounted game. Max Payne, Crysis 2 and 3, Dead Space, Entire Ubisoft Library, DmC, Dishonored, and the list could go on, and on. All perfectly capable of having the settings increased, (dependent on PC hardware of course), and are not System restricted. Defend Sony or its affiliates, all you want. But Greed is greed. Um, haven’t you noticed every publisher is doing tons of remasters nowadays? At least it makes sense for Sony, for the people who own a PS4 but never owned a PS3. Will this bundle include a disc of the game(s) or code for the digital download? Look at the box, says “digital voucher” and something about it expiring. Jesus take the wheel i dunno what to deal with a this or the battlefront bundle lawwwd jesus christ all this playstation greatness my soul can’t take it!! There is a Battlefront bundle??!! imo: get the Battlefront bundle. Comes with 5 games. Buy the ND Collection separate. I refuse to buy a ps4 until you change the canadian price back to the same as the US price. The Xbone costs the same here as there, yours should too. For a Canadian buyer, the PS4 is actually cheaper in Canada. If you take 400 Canadian dollars to the states you’d only have 300 American dollars…100 short of the US price. You don’t know about purchasing power, huh? Are you suggesting the PS4 would be cheaper in Canada than it currently is if it was priced on the basis of relative purchasing power? And that such pricing would make sense even though the PS4 is an imported good in both the USA & Canada, and Sony itself is subject to exchange rates? If you are, please expand. It would be a lot more interesting than the constant complaining about PS+ “being a ripoff” because it’s not giving out all the retail games like Halloween candy. 3. Wait for a $50 the price reduction in Canada…a discount has already happened at least twice this year. Since they are not willing to do #1, and #3 has already happened, I guess it’s time to ask if you can point them to a international vendor…one in a country where they can import a PS4 that is cheaper after currency conversion, shipping costs, and any import duties (note: don’t forget the Blu-Ray region considerations). Many Canadian PlayStation fans would appreciate this information! You guys need to do more of those Project SkyLight faceplates; I’d love a faceplate for Uncharted and this would have been the perfect bundle for one, or as a standalone item. My friend who is waiting to get a PS4 and loves Uncharted is very excited. As I just heard, i immediately alerted him. One of my favorite stages is the cruise ship from Uncharted 3 when it’s sinking. I’m so anticipated for this collection, i feel really tempted to pre-order the digital version now. does this mean the bundle does not include the multiplayer aspect of the games? Nope, no multi-player or online co-op. The ones who ported this are completely missing an integral part of the Uncharted experience. What a huge giant joke…putting PS3 games into a PS4 bundle.Ha wonderful people may wanna buy a PS4 to play PS3 games after all…the gaming industry is really in the damn mud.The worst shame in all this is that people embraced and still embrace these uuh….practices. You do realize it’s remastered, upgraded graphics, resolution & FPS. for 3 games at that price, it’s a steal. You assume everyone has played these great games, some PS4 owners don’t even know what Uncharted is, they will be blown away when they find out they can play this great trilogy on their new consoles. It’s been 2 years and still packing a 500GB drive really? You severely limit a customers buying capacity. How about no HDD drive? I would love to see a PS4 core editon or DIY. Like $299 and you add your own drive and headset. Comes with no games. Includes one controller. Darth Vader PS4 pre order date? Sony were doing great by offering physical pack in games. Really disappointed to see them start down this path. Has to be one of my all time favorite games to play. Change that digital voucher for a phisical disc and you can have all my money Sony. Or at least an non limited edition black PS4 The taken king bundle with a phisical disc. @John Koller last i checked we were promised a demo before the end of summer and its september so i assume this month then. Can anyone here PLEASE tell me why it being Star Wars Day they didn’t announce Pre Orders for the Darth Vader PS4. England already has had preorders for it, WHY NOT US? I guess trying to sell me games I already own on the Ps3 with more content is still less embarrasing then Sony trying to sell me a bunch of rejected cellphone games on the world’s most powerful console. Again with the boring black?!!! I’ll wait and try to get the Darth Vader edition; at least the boring black makes sense there! In the meantime, John, this month you all are releasing the special 20th Anniversary controller so I am looking forward to that. They are long sold-out on Amazon. I really hope this become the default system bundle now. The last of us one has been on for a while and should be retired. Dont get me wrong I love me some last of us. But, its time for something new for a bit. And 3 full campaigns may sell more systems than 1 full game. PS4 is still regretting that it doesn’t have backward capabitable instead they keep giving us a PS4 version it’s a joke like I care about God Of War 3 when it should’ve been God of War 1 to celebrate to ten year anniversary . This is a great bundle ty ! To be honest I was really hoping to pre order the Star Wars PS4 Console Bundle today but oh well ! Can you at least include an Uncharted themed Faceplate on the PS4 bunduru? Best Video Game Ever! Great idea for a bundle but I think it would have been better with Uncharted 1,2,3 and 4. In other words, wait until the new year to release this bundle. Instead this gets released now and I’ll bet another one with the ‘new’ uncharted in q1 2016. Regardless…keep the great games coming. Force Friday…..EVERYONE selling Star Wars stuff…but trying to get an answer from Sony or Gamestop about the Darth Vader PS4 is super frustrating. No moderator has EVER answered a question from me in my 20 plus years owning PS1-3 and Vita. Europe/Britain already have preorders, so why not us? will this bundle or any bundle for that matter) still include a digital download of the last of us? Will the games be physical or digital? Definitely can’t wait to play this, but still not buying a ps4 until the 1tb ps4 is released. Still 500 gigs? Sony have you seen the sizes of those installs? People are running out of space FAST. This should’ve been 1TB especially when the competition is releasing a 1TB version of their console. Either increase it before release or give us external HDD support. I remember when consoles came with new games. Oh the memories…..
I’ve calmed down. When I first ready this, I read it as $399 for a bundle of the Uncharted games ( no console ) and was trying to figure out who would pay that much for 3 remastered games, lol. Please put the word “console” in the bundle title going forward so that it is clear that you are not bundling several games together, but instead are bundling several games together with a console. Since I already have a PS4, this is non-news to me. How much for the remastered Uncharted Games without a console? not sure why on earth you would even think that they would charge $400 for three games.. and if they were they would call it a collection(which they are) not a bundle and they stated before here at this very blog that it will be releasing for $59.99 some people really make me wonder…………………. hi people, loved all three games. also loved all of mass effect and until dawn. thought they were all great games. and games that I would play again. mass effect I,ve played 4 times already. best game out there. They should have at least used the 1TB model. Those three games alone are gonna eat up half the HDD. Where’s the demo? It was promised for ”Summer”, but summer is basically over now.